On the latest episode of Travel Channel’s Kindred Spirits, Amy Bruni & Adam Berry investigate a mysterious haunted mirror in Gettysburg’s famed Farnsworth House. 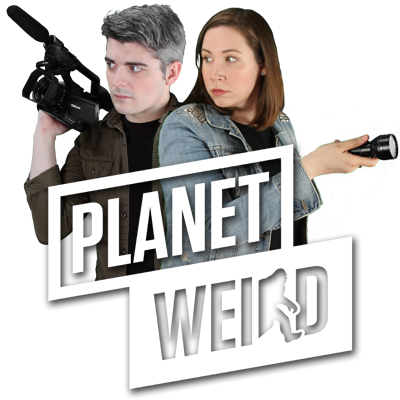 With help from haunted object experts Greg & Dana Newkirk, the paranormal investigators use the object to construct an ancient device meant to contact the dead: the psychomanteum. Whether using tarot during investigations, performing classic seances, or making use of the Estes Method, sometimes its the most unique tools which provide the most intriguing responses. On Thursday’s episode of Kindred Spirits, Greg & Dana Newkirk, curators of the Traveling Museum of of the Paranormal & Occult, are drawn to construct a psychomanteum, a method of summoning the dead which has been all-but-forgotten by today’s paranormal investigators. But what exactly is a psychomanteum, and how does it work? Stemming from the Greek “nekromanteion”, which translates to “oracle of the dead”, the psychomanteum was such a popular method of spirit contact that they’re made reference to in the epic Homer’s Odyssey, where Odysseus speaks with his dead mother by gazing into a pit of blood. It wasn’t until the 1950s that archaeologists actually excavated one of the devices in Epiros, officially pulling the psychomanteum out of legend and into reality. While crystal balls, mirror scrying, and other forms of chiromancy remained popular throughout the years, it wasn’t until 1993 when Dr. Raymond Moody, a researcher of near death experiences, published the book Reunions: Visionary Encounters With Departed Loved Ones and brought the psychomanteum back to life. In his book, Moody recounts how he took inspiration from Greek nekromanteions and other shamanic mirror-gazing traditions from around the world, constructing his own psychomanteum, and documenting some three-hundred individuals’ experiences with the method. In a room blocked of all sunlight, Moody placed a chair in front of a large mirror hung on a wall which was tilted forward at a 45 degree angle, so as to obscure the gazer’s own reflection. Behind the chair was placed a low wattage lamp, meant to replicate the soft glow of a single candle. Before seating themselves in the psychomanteum, subjects were asked to focus on a loved one who had since passed. Then, the gazing session would begin. The results were astounding. Out of the subjects, a quarter of them stated that they had made contact with the dead, seeing and even speaking with their loved ones in the mirror’s reflection. About ten percent of these subjects even said the spirits actually came out of the mirrors and touched them. In nearly a quarter of the cases, the contact with the dead didn’t occur immediately, but within 24 hours of the psychomanteum session. Even more startling, nearly every single subject strongly stated that their reunions were not fantasies or dreams, but insisted they were real events with elements of physicality. Dr. Raymond Moody wrote that the sessions with his modern day psychomanteum weren’t just an effective method of contact with the dead, they quite literally changed the lives of the users, healing wounded relationships with the deceased and reshaping the way they saw the world. With such a powerful tool so easy to create, why aren’t more paranormal investigators using the psychomanteum? Mostly because they don’t know the method even exists. Like many traditional methods of spirit communication, they’ve been forgotten, replaced with fancy gadgets as seen on television, or branded as “dangerous occult practices”. 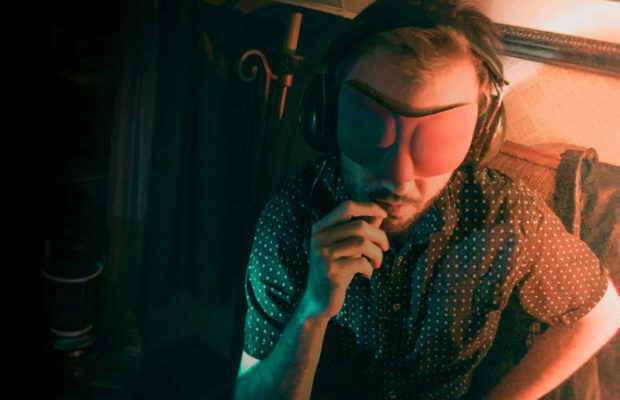 For this reason, The Traveling Museum of the Paranormal & Occult has spent the last several years roaming the country with a portable psychomanteum, swapping a quiet room for headphones and white noise, and educating the public on the history and practice of therapeutic mirror gazing. On the the third season three episode of Travel Channel’s Kindred Spirits, that lesson will be shared with an even wider audience. 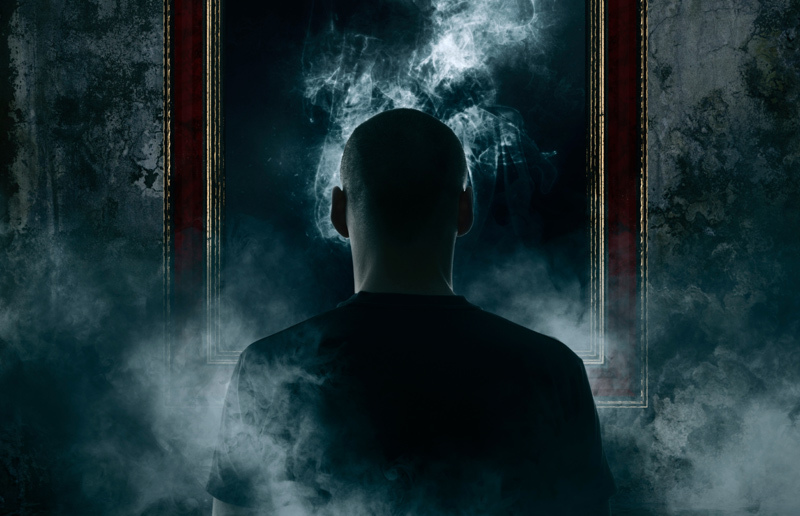 Of course, things are bound to get even stranger when you build your psychomanteum out of a gigantic haunted mirror in one of the most paranormally-active locations in the world. With only a few days left to shoot the case, Amy & Adam were looking for a way to investigate the mirror that would yield the best results. The team immediately got to work building what might be the largest modern psychomanteum ever. In the episode, the group heads to the basement, which the owners had styled to represent a traditional Civil War era funeral, and gingerly began to tilt the massive mirror to a 45-degree angle. 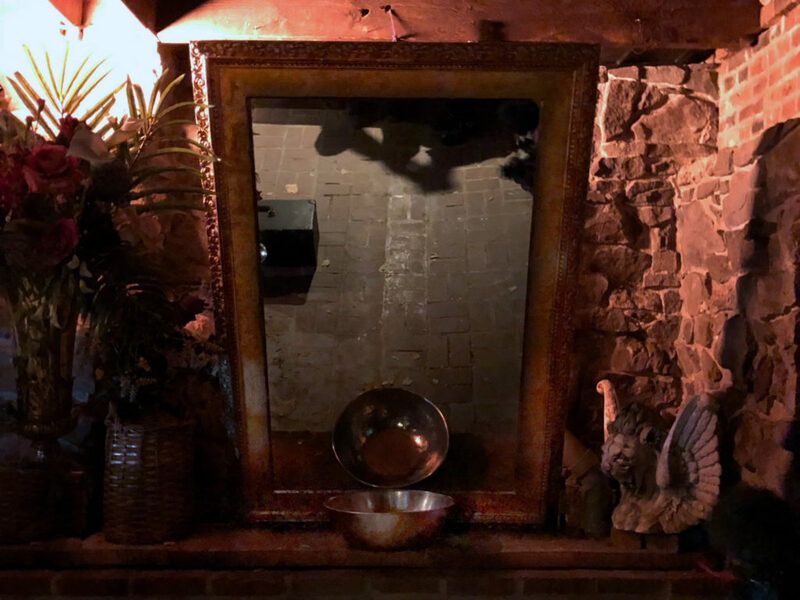 Once it was safe and secure, Greg placed a bowl of water beneath the mirror – a step that Dr. Raymond Moody had left out of his modern psychomanteum (the Greeks would often gaze into the water’s reflection in the place where the mirror made contact with the water). Once everything was secure, he lit a single candle behind the designated gazing seat, and hit the lights. Adding one more twist to contraption, it was decided that both Dana and Amy would use the psychomanteum at the same time. Not only was it big enough, but having two gazers would help confirm or negate the visions presented in the mirror as merely hallucinations… or something more. We won’t spoil the episode for you, except to say you’ll be shocked at the outcome. Tune in to Travel Channel tonight at 10PM EST to catch the whole investigation on Kindred Spirits. 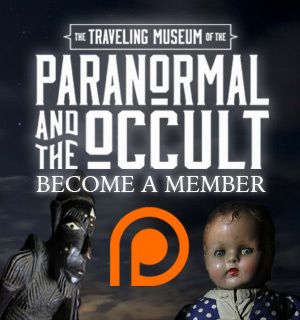 If you’re a member of the Traveling Museum of the Paranormal & Occult (and you should be), you can join Greg & Dana Newkirk at 11:15PM EST for a live post-episode discussion in the Super Secret Museum Member Facebook group.